Is the Breakfast of Champions What it Takes to Make Champions? - Are You Eating It? The breakfast of champions - should you be eating it or should you eat breakfast at all? With more than half of North American adults being overweight or obese it isn't surprising that many people skip breakfast thinking this is going to help their weight or their overall health. But is this true? Many people struggle with their health in so many ways not knowing that something as simple as eating breakfast can be a great help. It can even lengthen your life! Science has shown that, indeed, breakfast is the most important meal of the day. But, unfortunately, skipping breakfast is now a common habit even though it impairs daily functioning, can result in weight gain and other problems. Let's consider how the breakfast of champions helps to produce winners. Eating breakfast helps to keep off or shed excess weight. It has been shown that breakfast eaters tend to have a lower body mass index (BMI) than those who don't. Eating breakfast gets the metabolism going early in the day which raises body heat and metabolism. People tend to develop eating habits that stick with them for a long time. Obese people are more likely to skip breakfast, leading to a higher caloric intake at night. They tend to be less active in the evening and, of course, at night they don't use as many calories. Eating more food later in the day promotes fat storage and weight gain. Fear of weight gain is not a good reason for skipping breakfast. Skipping meals, especially breakfast, sends a message that your body is possibly going into a time of food shortage and your body will adjust metabolism by slowing it down to conserve calories and store fat reserves. 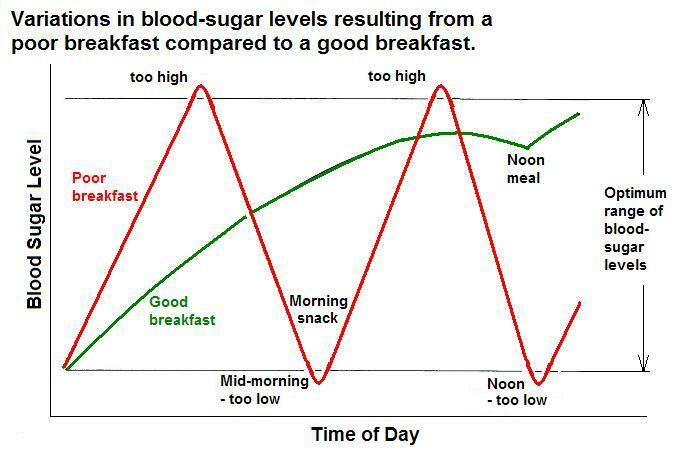 A big advantage of the breakfast of champions is that it evens out wild fluctuations in blood-sugar levels as the following chart shows. A breakfast with insufficient fiber will release sugars into the blood too quickly resulting in a spike in blood-sugar levels. The pancreas reacts with an injection of insulin and overshoots so that the high insulin causes the blood sugar to drop too low. Eating a good breakfast with lots of fiber and not too much sugar or fat will help to maintain a more constant blood-sugar level. Aside from weight control, there are other benefits to eating a good breakfast. Children get higher grades in school. There is better on-the-job performance and fewer accidents. Having fuel on board leads to improvements in cognition and fatigue reduction. Do you find it hard to face breakfast or eat enough to make it anywhere near the largest meal of the day? If so, it is likely because your habit is to make your evening/last meal of the day the largest. This, of course, will make you less hungry for breakfast. The solution is to start eating less at the last meal - you will find your appetite for the first meal the next morning will increase. Perhaps eating a little more at your mid-day meal will also encourage eating less later in the day. Gradually, you can shift your largest meal of the day from the evening to the morning and you will be better off for doing it. Studies have even shown that eating breakfast is a significant factor in increasing your lifespan. So if you want to eat the breakfast of champions, you had best check your champions eating habits.